Cake originally made for Boo in Jan 2008. My baby was turning one. 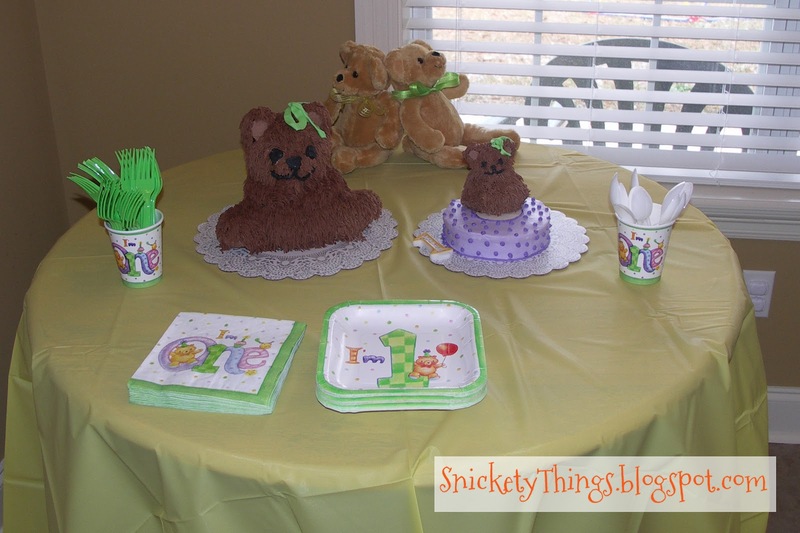 With one first birthday under my belt I felt a little more comfortable doing this party. I also had learned quite a bit about decorating a cake by this point. I only needed inspiration. I found it at a local party supply store in town. 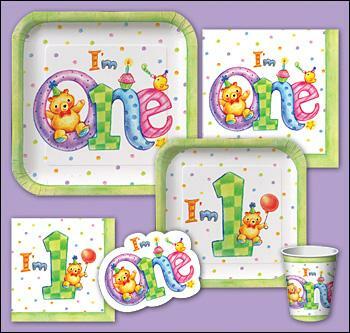 It was this "I'm One" set that was also posted on Oriental Trading (I think, I could no longer find the picture on their website). My local store had the "I'm One" napkins and the "I'm 1" plates so that was what I went with. I latched on to the teddy bear in the picture and made it the center of the party. Lucky for me, Wilton has a 3D bear pan, as well as a smaller version of the same pan. Since it was a bear, and bears are usually brown, I decided on chocolate cake and chocolate buttercream icing. 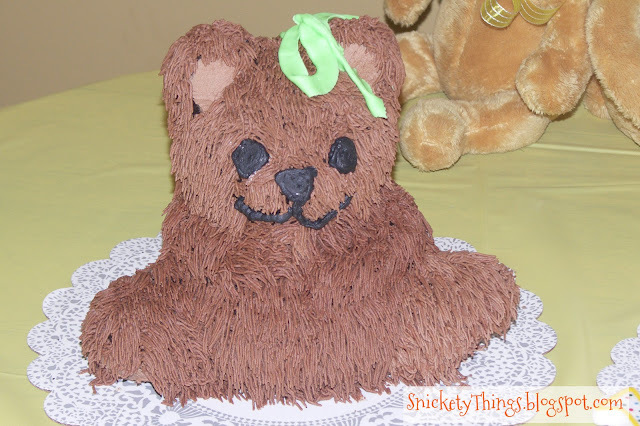 As with the Elmo cake, I thought my bears need to look furry, not like the usual stars. I chose the grass tip (Wilton #233) to make the fur. First, I covered the cake in a thin layer of the icing. I went ahead and did the black for the eyes and nose. To do this, I just tinted a little of the chocolate black. I also made sure the inside of the ears looked good since I wasn't covering it with fur. I then went to work covering the bear. 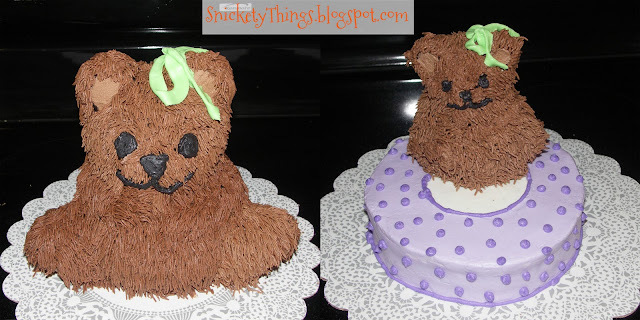 For the smaller smash cake, I decided I wanted the bear to be sitting in an "O" like he was on the napkin. I made a six inch round cake and carefully iced it to look like the "O" in the picture, complete with the little dots. I then placed a small dab of icing to hold the undecorated mini bear to the "O". 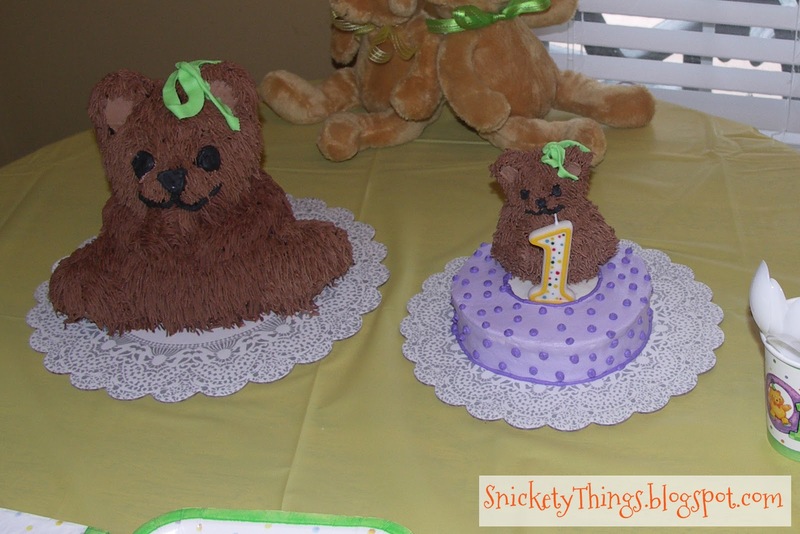 At this point I proceeded to decorate the small bear the same as the larger bear. I did it this way out of fear of destroying all my fur work when I transferred it to the small cake. I finished both off with an icing bow. 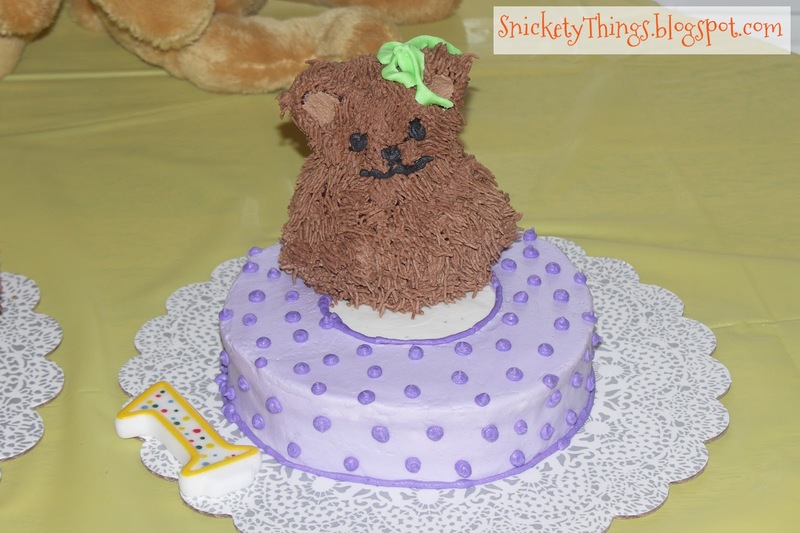 I know the pictured bear had a party hat, but this was much easier for me at this stage. Here is a shot of the bears at the party. Here are some better shots of the cakes. I wish I could have found the candle that came with the set for the cake (it looked like the "1" on the plates), but I had to settle with one I found at Walmart. It still looked cute. Here is a shot just before we lit the candle.